The Roots of the Les Paul begin at Epiphone: Les Paul in the House of Stathopoulo. For over 50 years, Les Paul encouraged and cheered on Epiphone to keep Les Pauls on the cutting edge of electric guitars. And remember like all Epiphones, the new Epiphone Ltd. Ed. Les Paul Custom 100th Anniversary Outfit comes with Epiphone’s time honored Limited Lifetime Warranty and world-famous 24/7/365 Gibson Customer Service. Visit your Epiphone Dealer and make some rock & roll history of your own with the Epiphone Ltd. Ed. Les Paul Custom 100th Anniversary Outfit. A Les Paul Custom Fit for a Wizard! The new Epiphone Ltd. Ed. Les Paul Custom 100th Anniversary Outfit features a classic Mahogany body with the time-honored Les Paul profile in both a Cherry finish with a Mahogany veneer and a Natural finish with a AAA Flame Maple Veneer. Both finish options have 5-layer Cream and Black binding on the top and back. The Mahogany neck has a 1960s SlimTaperTM D-profile and is glued to the body with a Mortise and Tenon neck joint. 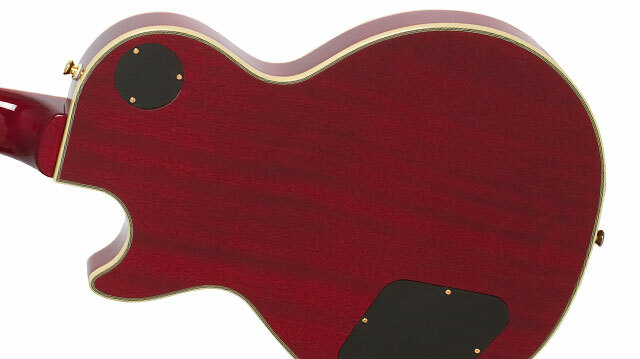 The smooth fingerboard is bound and has a 12” radius with 22 medium jumbo frets, a 24.75” scale, and a 1 11/16 nut. The Mahogany neck features traditional Epiphone Block & Triangle inlays in Abalone and Pearloid. The Les Paul Custom 100th Anniversary Outfit has many other beautiful features that set it apart from any other Les Paul ever made including a 24K Gold plated metal truss rod cover engraved with "Les Paul 100th Anniversary. Plus, the traditional “Sloped Dovewing” headstock has 5 layer Cream and Black binding and features the original Epiphone “vine” inlay in Pearloid, a classic 40s era Epiphone logo with a Zirconium Gemstone dotting the "I", and on the back of the headstock a "The Legacy of Les Paul: 1915 - 2015" commemorative decal. The Epiphone Ltd. Ed. Les Paul Custom 100th Anniversary features Epiphone’s critically acclaimed ProBucker™ pickups, a 4-wire design with coil-splitting inspired by Gibson’s legendary BurstBuckers™. Since their introduction, Epiphone ProBucker™ pickups have beguiled pros, luthiers, collectors, and guitar magazine editors and their consensus is ProBuckers aren’t “like” the real thing—they are the real thing! ProBucker™ pickups recreate the sound of the original hand-wound “PAF” humbuckers designed by Seth Lover at the Kalamazoo factory in the late ’50s by featuring all the same ingredients as the originals including Alnico II magnets, Elektrisola magnet wire, 18% nickel silver unit bases and covers, and pole screws, slugs and bobbins manufactured to Gibson’s original specifications. The result is a phenomenal pickup that, over time, will develop the subtle, one-of-a-kind characteristics that previously you could only get from vintage humbuckers. And best of all, those unique pickup characteristics will give your guitar a unique “voice.” No two vintage Les Pauls sound alike and ProBuckers™ will give your Epiphone Les Paul Custom 100th Anniversary a one-of-a-kind sound that will only get better the more you play. So plan on playing this Les Paul Custom a lot! The Ltd. Ed. Les Paul Custom 100th Anniversary Outfit comes with a ProBucker™-2 humbucker in the neck position that is slightly overwound for greater definition at higher volumes. The bridge pickup is a ProBucker™-3 humbucker, which is also slightly overwound to give your solos a wide tonal range. Each pickup features coil-splitting via a push/pull control at each pickup’s volume knob. 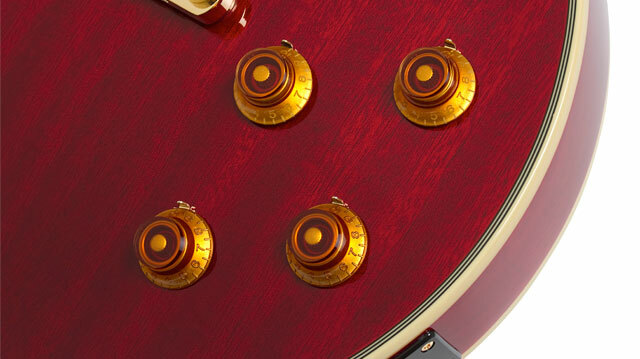 The Cherry finished Les Paul Custom features Amber “Top Hat” controls with metal pointers while the Natural finish features Black Speed Knobs with metal pointers. All volume and tone controls have full-size 500K Ω potentiometers matched with Epiphone’s rugged, all-metal, 3-way toggle pickup selector switch for long-lasting performance. 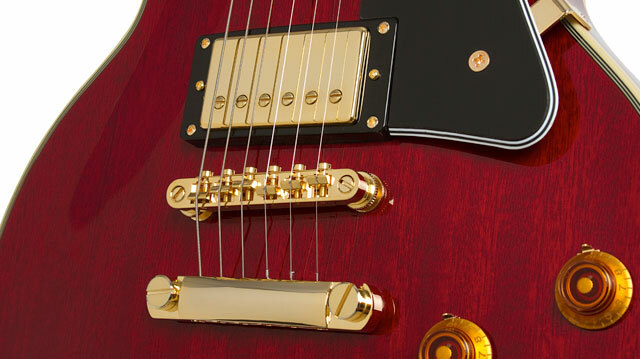 There is no other Les Paul on Earth like the Ltd. Ed. 100th Anniversary Custom which features 24 Karat Gold Plated hardware including a gold plated truss rod cover engraved with “Les Paul 100th Anniversary,” a gold LockTone™ Tune-o-matic bridge and Stopbar tailpiece, a gold Epiphone heavy-duty non-rotating output jack, and gold Grover™ 18:1 machine heads with stepped "Imperial" buttons. Every Epiphone Ltd. Ed. 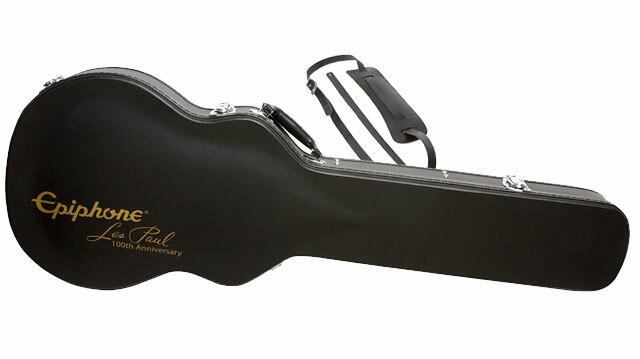 Les Paul Custom 100th Anniversary Outfit also comes with a Hardshell Case with a 100th Anniversary Commemorative Logo, a vintage-style strap, 3 Commemorative Picks, and a Certificate of Authenticity in a presentation binder.